It’s been a while since I have posted but that doesn’t mean that I haven’t been meal planning – or eating! But my meal plans have been pretty lame and more off the cuff than usual. We returned from vacation last night to an empty frig and thus today I was inspired to get together a better meal plan. 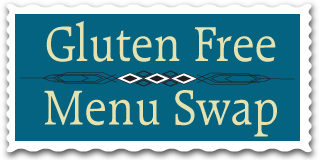 This week’s Gluten Free Menu Swap is hosted by Cheryl at Gluten Free Goodness and her chosen theme is sugar-free delights in honor of the upcoming sugar-laden holiday(s)! Be sure to stop over at Cheryl’s later this week when everyone has posted their meal plans for a lot of inspiration. As I was writing up my plan this afternoon, I thought that perhaps some of you would like to know more about how I menu plan for the week. Generally my husband and I eat the same mix of breakfasts and lunches throughout the week, so I don’t really ‘plan’ those, per se. But as I start writing up my grocery list, I check the frig and freezer for the ingredients and foods we eat. Here is what is typical for us both on the average work-day. We are a reduce, reuse, recycle family, so we save a lot of scrap paper. In particular, I save those extra envelopes that come in bills or what have you and put them in the kitchen junk drawer. 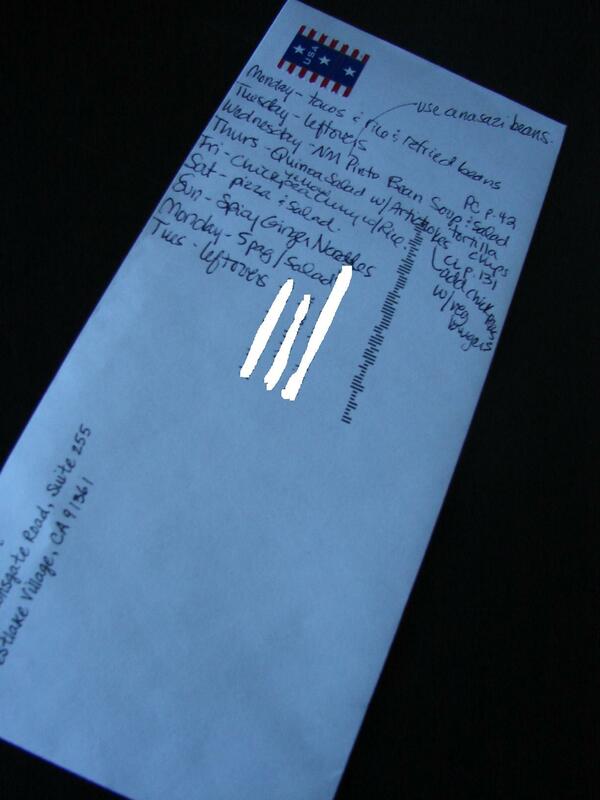 I use these envelopes mainly for my grocery lists. When we used to eat a lot more items that were processed, I would also place the coupons for the week inside the envelope so I had them at my fingertips. But as we have evolved away from fewer and fewer processed foods, we have found that there are not too many coupons for fruits and vegetables and other whole foods! This use of the envelopes is one of the habits I have learned from my own mom over the years, although my own system has evolved too. One key to keeping a well-stocked frig and pantry is to keep a running grocery list. So I keep one of these envelopes clipped to the frig and when I run out of something, I just write it down. That way I don’t go to the cabinet expecting something to be there in the middle of cooking and find I have run out. This is the start then of next week’s list. So, I do a quick scan of the cabinets and frig for the breakfast and lunch items above. Then I take a general look in the frig and pantry to see what in there needs to be eaten up. Half a head of broccoli or some green onions or some such ingredient. I write these items on the bottom right of my envelope to keep in mind. I hate to waste food, and even with our own laying hens, I don’t like to “waste” certain scraps on them! Then I grab my latest issues of Cooking Light and Sunset magazines, and some favored cookbooks, and come up with a couple of ideas. As I come up with ideas, I use the back of the envelope to write the ideas down ( see below). I typically don’t attach days with meals, although sometimes I will depending on what the week holds for us. Or I may just write the days down and then meals next to them while not necessarily planning for them to match up, as I’m just looking at quantity of meals. I do plan for leftovers since there are only two of us in the household. And I write down the cookbook and page number if it is in a magazine or cookbook. If it is in my recipe binder or box, then I will flag it with a post-it or pull the card out and hang it on the frig. (Click to make it larger.) Meals listed on the back of the envelope. Yes, a horrible job of whiting out our address...sorry about that! 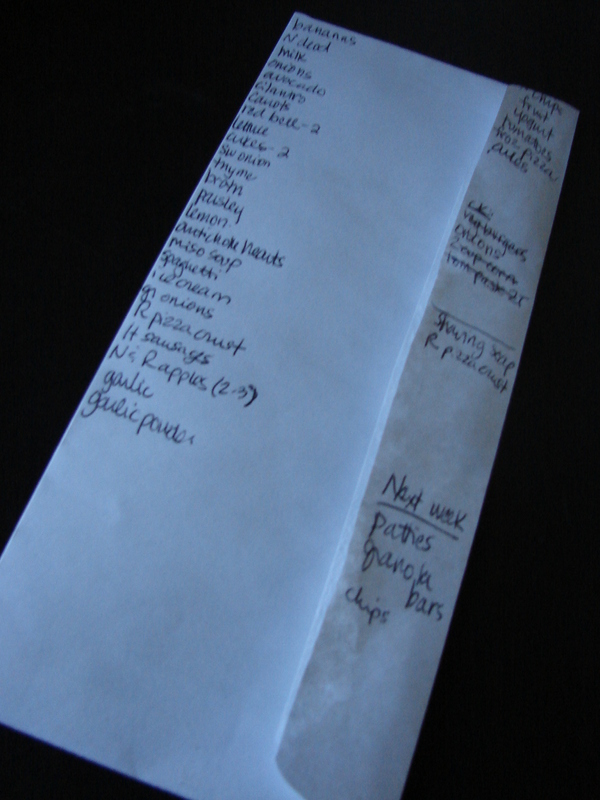 As I add the meals to the back of the envelope, I am adding grocery items to the other side of the envelope. I typically hit up three grocery stores in my weekly trip – Costco, Trader Joe’s and Smith’s (traditional grocery store). So I do separate out my list slightly. As you can see below, I have the main list for Trader Joe’s and Smith’s on the left side while the Costco stuff is at the top right. Then about mid-way down on the right is the Whole Foods list – I do not go there very often, maybe twice a month. This week it says shaving soap and R pizza crust (meaning a GF crust for me). Typically I would place the list of items languishing in my frig at the bottom right also but since we have been on vacation there wasn’t much of anything in my frig to make note of today. You can also see on the right side, about the middle, my ‘check’ list. These are the items I need to check my pantry or frig for, but don’t want to check for while I am coming up with the plan. Once I am done planning, I get up and rummage through the freezer and cabinets once more to see if I have these items and can cross them off or if I need to add them to the main shopping list. Then I am set to go! I typically try to do my shopping once a week, on Tuesdays. I do NOT like going to the grocery store on the weekends nor do I like going to the store multiple times during the week. I take this list with me and I mark off the items as I put them in my cart. If I don’t mark them off, I always forget something! Some people (my mom!) are even so organized that they know where things are in the grocery store and so write their list out so that the items are in (approximate) order in which she travels through the store. I’ve tried, but just can’t do that. Then the list comes back home and gets hung up on the side of the frig with the meals showing, so that I can see what the options are for the week. One more tip – if you use reusable grocery bags, be sure to put them right back in your car after you empty your groceries. That way they are there when you need them. It may take a while to program your head to remember to bring them into the store, but in time you will remember. I hate plastic grocery sacks! So that’s how I do it. What are your tips for meal planning and grocery shopping? After typing all that I was ready to hit publish. Ha! But I still need to add my meal plan! And a couple of other meal planning thoughts for you…I try to keep our tofu consumption to once a week, although there is none below in this week’s plan. New Mexico Pinto Bean Soup with Salad and/or leftover Rice – this soup recipe is great, it’s from Lorna Sass’s Great Vegetarian Cooking Under Pressure. I will use some of my Anasazi beans instead of pinto for this as they cook very similarly. Quinoa Salad with Artichokes and Parsley – a new-to-us recipe from this month’s Cooking Light magazine. I will add a can of chickpeas or eat with veggie burgers for protein. looks like your scrap paper meal planning is the same style as mine. I couldn’t agree more–many times my meals are not as inspired, but writing them down helps me mentally organize. The spicy ginger noodles look delish! Thanks for stopping in Cheryl! We love the ginger noodles. It’s been a while since I’ve made them but they feel like spring…and it’s finally here! Great menu planning tips, Renee. I tried something new this week and used my iPhone and an app. It really helped me get a plan together in the midst of chaos. That quinoa salad sound great with artichokes. Wendy – What’s the app called? I am on the Android platform so I’d have to see if they make it for it. I am always looking for things to help me out. I would love an app that would help me comparison shop for groceries.